From its inception, Trinity Power Rentals has been more than just an order desk and delivery service for power generating equipment. 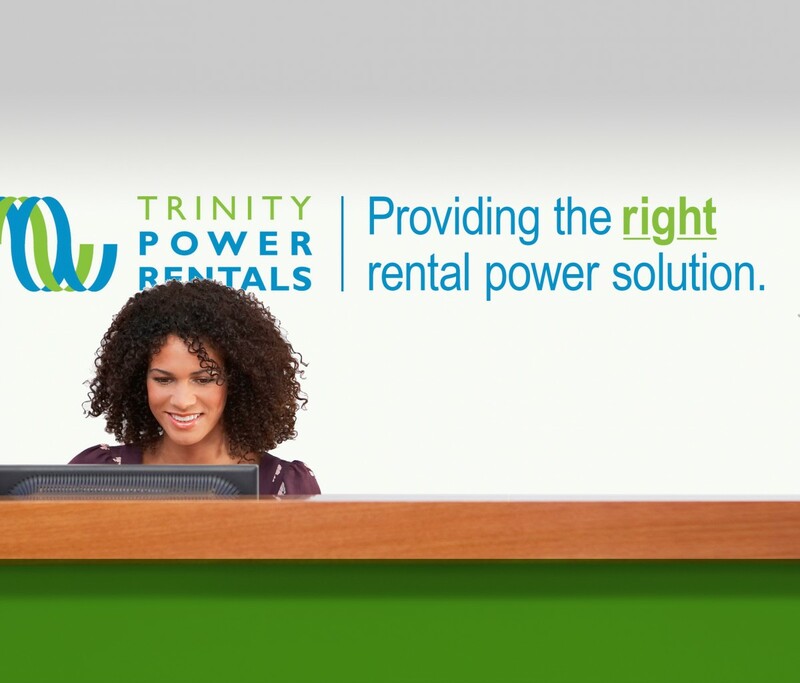 Trinity Power Rentals’ success has been built on a legacy of customer service and doing things right. A multi-generational family business, this power rental company was designed to be a concept-to-completion solutions provider. In fact, their team doesn’t see the business as a rental company at all – Trinity Power is in the business of delivering power assurance. In 2003, Trinity Power shifted their core focus to the industrial and commercial sectors, and then came expansions into the oil & gas, mining and construction industries. 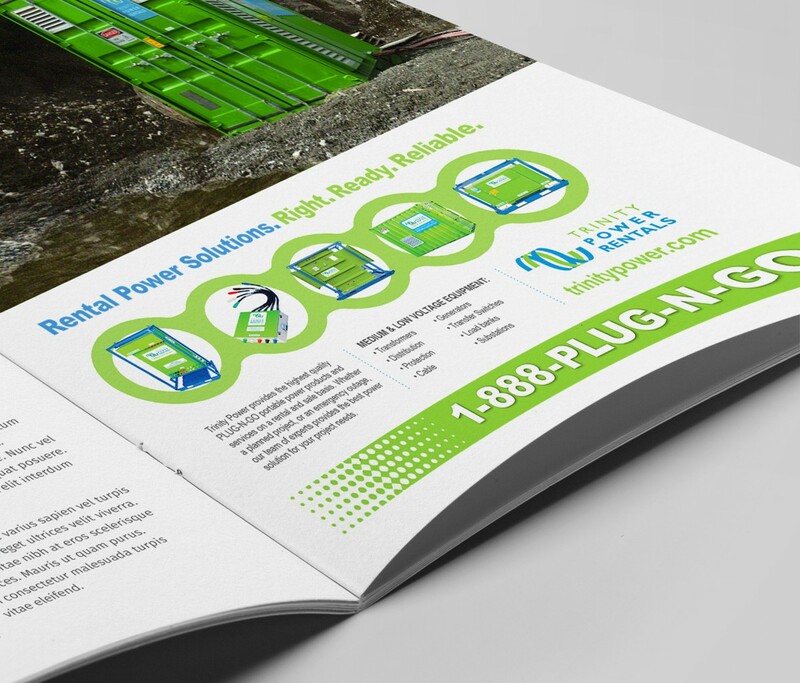 After a significant period of growth, Trinity Power came to us with a combined, marketing, sales and brand challenge: beyond their circle of existing clients nobody knew that Trinity Power was renowned as one of Canada’s premiere service providers. Add to this, their website and key marketing materials had become dated and they were failing to attract the right types of new clients. Trinity Power was in need of taking quick action to upgrade all of their public facing assets to support the aggressive growth goals set out for the next year by the leadership team. Working with the Sales Director our goal was to develop a brand strategy and core messaging that would reposition the company as the premiere service provider in their specialized sectors. Clearly defining their sector specific audiences was the first step to developing their core messaging and targeted content for their key marketing materials, including a completely restructured website. The sales team was reinvigorated by the crafting of Trinity Power’s unique value proposition and a powerful brand promise. The next objective was more administrative in nature, but still important in attracting the right type of customers, and making it easy to move them through the sales funnel. Trinity’s recent, rapid sector expansions resulted in the addition of several new products to their catalogue. We took charge of restructuring the catalogue to make it easy for them to find what they were looking for both in the print and online catalogues. 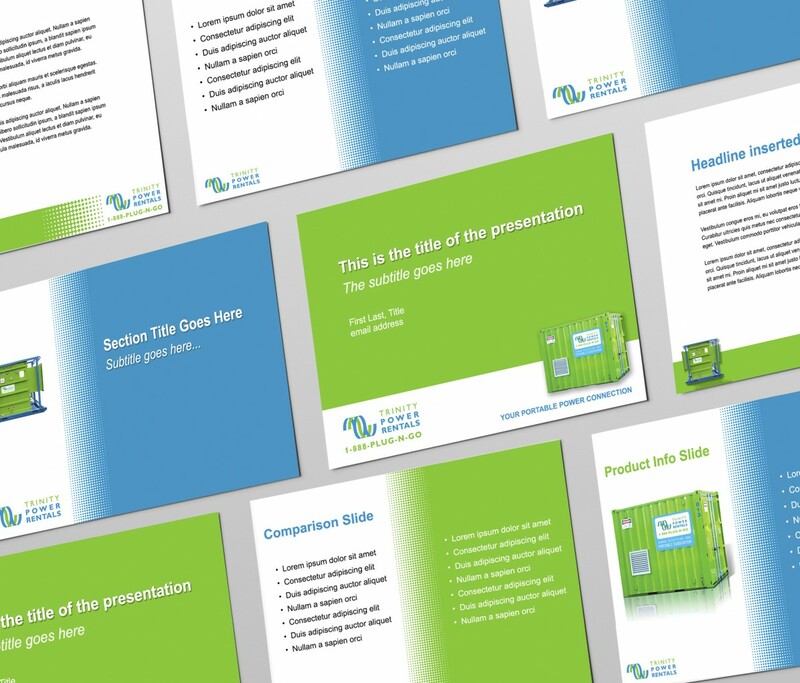 We were also able to create an organizing system for products that saved time and energy for the marketing team to keep both catalogues up to date. This was achieved without an overwhelming homepage and a user friendly navigation system. Trinity trusted us to leverage what was currently working and what wasn’t. 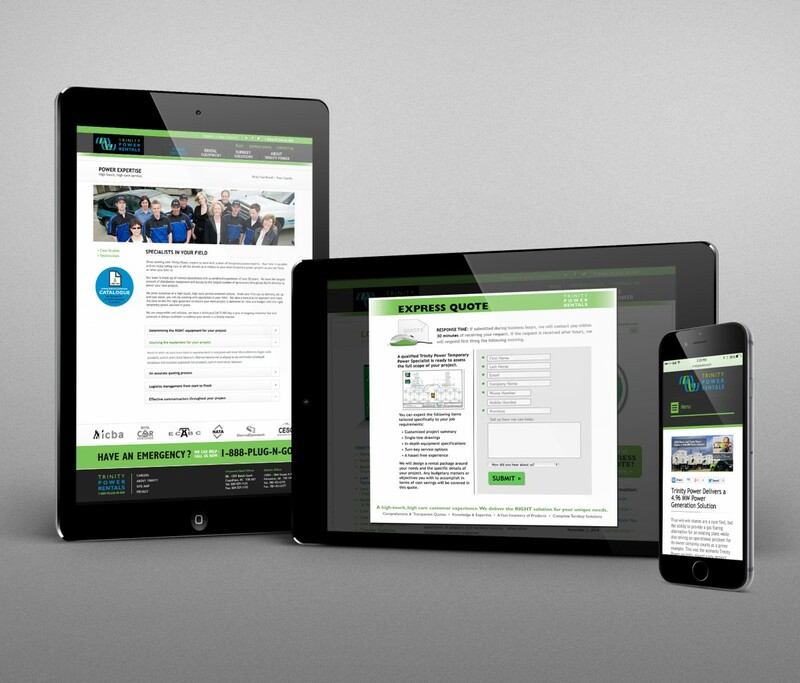 We delivered a new, fresh and modern look that was rolled out in the new site design and across all print materials. The company was set to take the stage as the industry leader. When the new Marketing Director joined the team, with expertise in online marketing and sales and with the new brand strategy and core messaging in place, he was able to launch the new website and brand revitalization into the market, creating significant buzz. 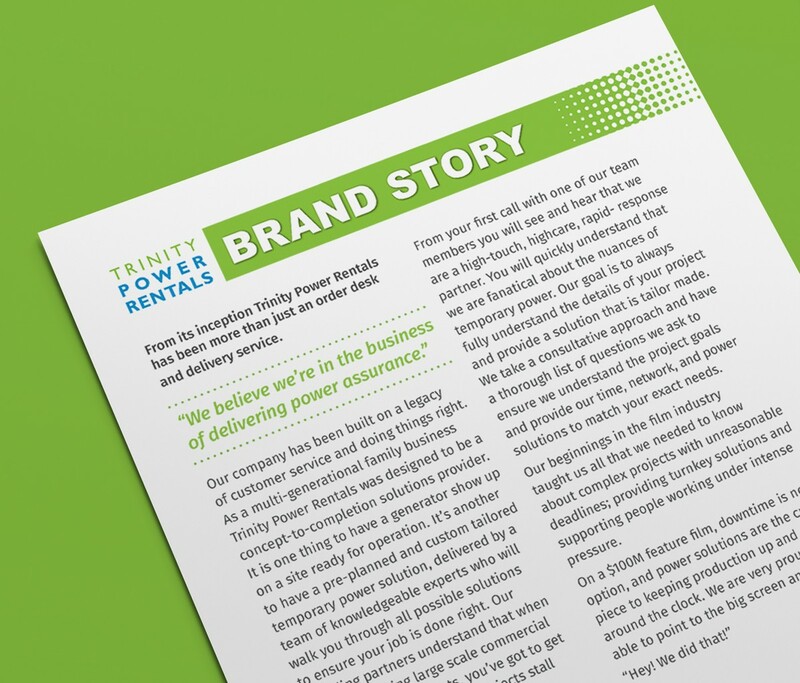 The industry and existing clients took notice of Trinity Power Rentals new, modern, commanding look that quickly made it evident there was a new leader on the scene. 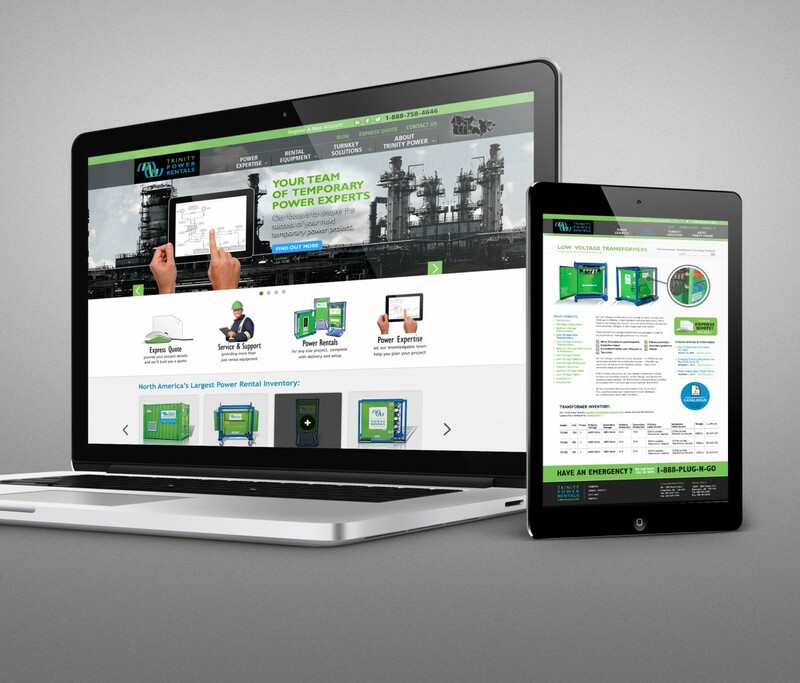 Utilizing the new website as a platform to communicate industry best practices, promote their strategic partners, discuss industry challenges and post case studies that exhibited critical learning, Trinity Power began attracting the attention of the customers they were seeking and engaging them in conversation. The Marketing Director was able to easily create landing pages for specific online advertising campaigns on the fly and attract new business; with the benefit of a complete tracking system in place. Plus, the sales team was seeing an influx of the right types of new clients, assisting them in reaching their sales goals and growth objectives. Look at what they known for and the website isn’t conveying that – delivering on their brand promise. I stepped back and stayed out of it to let you and the team run with this. Today is the first time I have seen any of the website and I’m SO incredibly impressed!! [All can say is] Wow….wow, wow! You really, really did an amazing job. Managing the personalities and the lack of information, you’ve just done an amazing job pulling this together!